It's a combination that one dreams about. . . glacial blue-green water full of fighting rainbow and brown trout - unspoiled and eager for your fly. The Alto Puelo Fishing Lodge is located in the Patagonia region of Chile, just across the border from Argentina. A four-mile stretch of the Rio Puelo river and a lake eight miles long are at the lodge's front yard. 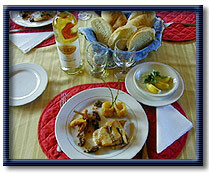 The lodge comes with a guide who knows them both, like the back of his hand and a fabulous chef at your beckoning call. The Alto Puelo is warm, rustic and comfortable. The stars at night are majestic and almost feel like you can reach out and touch them. Included with the price is a chef, whose only job was to create meals to delight the two of us (using the fresh farm produce from the property). In residence, are ducks, horses (a mare and newborn foal), cats and kittens, lots of wild birds, and of course a great dog (Gina, a brown Lab). The lodge has a well-conceived ecosystem. Solar power lights the lodge and cooking is on a wood stove. There is no television, radio, or telephone, except a satellite phone in cases of an emergency. Compost is used to feed the produce, all of which can be eaten from the ground. We tasted amazing asparagus, swiss chard, lettuce, edible flowers, several varieties of potatoes, herbs and all kinds of fruits. The whole space feels clean and self-reliant. It feels good to breathe the clean air, drink the water and taste the great food. It is summer on Christmas Day, and the skies are a radiant blue. Everything sparkles. Kent and his wife were there at the beginning. He discovered fly fishing while living in Northern California (saw a billboard advertising it and wondered what it meant!) and basically brought the sport to South America in the 70s, urged on by a travel agent in the United States. When Kent met the travel agent, he encouraged him to develop a guiding business for fly fishing, so Kent toured the Patagonia region of Argentina/Chile for years and hand wrote a list of 12 places and how to fish each one. When he sent the information back, the agent in California said: "I have booked 14 people for you to take fishing!" Off Kent went, driving his new clients on dirt roads and packing meals in a cooler. Patagonia Adventures began and never stopped, providing Patagonia hospitality and great fly fishing along the way. Kent's 24-year-old son Eric is one of the knowledgeable guides. Eric has the energy, the patience and the uncompromising passion for the sport, born of youth and long experience of the local water. Our schedule was extraordinarily civilized. We awoke about 8:30 AM, ate breakfast about 9:30 AM, and were out on the water around 10:00 PM. Breakfast was a light meal of fruit and either French toast or fritters. We fished for four hours, usually casting an 8 weight rod with streamers into the river, letting out 20-grain weighted line down to the backing, and stripping it in, often anchored in the jet boat, because the water was still very high. The challenge for me (still a beginner) is to feel the strike and set the hook with that much line out. We returned to the lodge around 2:00 PM for a three-course lunch. The meal included wine, an elaborate appetizer course (deep fried mozzarella; with a cold meat delicacy); skewers of chicken and vegetables; an elaborate entrée (barbecued lamb; chicken in a garlic sauce; homemade ravioli stuffed with broccoli); an elaborate dessert (cherry pie; cheesecake; brownie with homemade ice cream). Then a siesta until 5, when we went back out and fished, usually ending with dry flies about 9:30 PM, and another huge meal at 10:00 PM or so. Mike (my husband) loves to cook and we both love to eat, we have as many photos of the food as we do of the fish we caught. It became a challenge to pace yourself, so you don't fall into bed so stuffed you can't sleep! But we both had incredible dreams there-perhaps because of the intensity of the experience, and the focus on fishing, eating, and just keeping up. The fitness component cannot be overestimated, one needs lots of stamina, core strength, strong legs for wading (our Simms staffs were invaluable), and a strong casting arm to be at it eight hours a day. The fish we caught large browns and rainbows, which fought hard and were beautiful in color. There are holes on the Rio Puelo that are full of fish, so that the two of us would pull out perhaps 15 fish in a couple of hours and lose a bunch more. 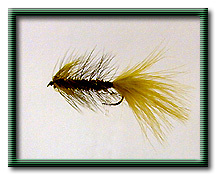 The most successful flies were the Chernobyl ant (orange and black, size 6); olive-bodied stimulators; and a special fly that Eric ties resembling an olive woolly bugger with a sparkly body and legs. We flew to Buenos Aires on Delta, which meant a hour long cab ride, around the city, from one airport to another. Kent recommended a Lan Chile flight direct to Santiago, and then change planes at the Santiago airport and fly direct to Bariloche, Argentina where Kent can pick us up. This flight is more direct and faster. 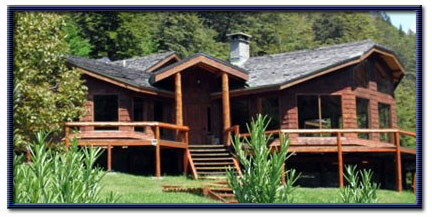 We also recommend several days in Bariloche, a beautiful resort town on the water with enough to see and do. "Do this trip! It's a winner." For more information on fly fishing the turquoise pristine waters of the Rio Puelo in Patagonia Argentina/Chile, contact Kent or Eric Schoenauer. 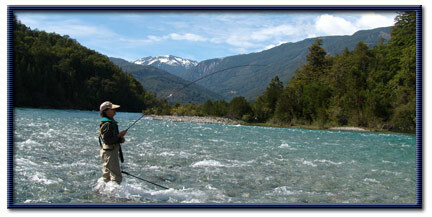 They can be contacted by email at eric@argentinachileflyfishing.com or by phone at 011-54-2944.-493280. 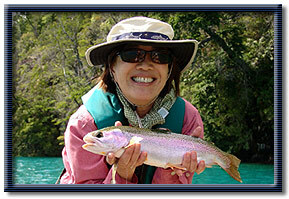 Kent will gladly assist you with your fly fishing vacation to the "River of Dreams"